In 2008, following her failed bid to be the Democratic nominee for president, Hillary Clinton lamented her loss: “we weren’t able to shatter that highest, hardest glass ceiling.” Ten years and one more defeat for Clinton, that glass ceiling for women in politics remains intact. Much of the country reflected following the 2016 election— about Clinton, about why we seemingly just could not elect a female president, about the state of women in our politics. And although absolutely necessary, the scrutiny does not extend nearly far enough. The office of the presidency is simply an ineffective metric for social progress. Although politics on the national scale garners much more attention, no less important are state offices: where most of the work gets done, yet no one seems to care. In my state, Massachusetts, only 25% of the state legislature is made up of women, and we are a relatively average case (27th out of 50 in terms of proportional representation). The best state, Arizona, has a legislature comprised of 40% women— the worst state, Wyoming, 11%. Achieving gender parity in state legislatures is imperative, not only in enacting equitable and just policies for women, but also for the functioning of our democracy, and in order to try to understand the gaping imbalance in our politics, I wanted to dig into my own state’s government. Although women represent half the population, they hold barely a quarter of the seats in the Massachusetts General Court. The importance of ensuring proportional representation of women can hardly be stressed enough— our system of government works if and only if our elected representatives accurately represent us. Even the most well-intentioned man cannot deign to know how a woman would vote in his stead, and thus, the only person suitable to represent women is a woman. This is, of course, not to suggest that women are a monolithic voting bloc with a singular political will. In fact, just the opposite: a politically diverse group of women debating and amending legislature is essential to fair governance. The number of women in the state legislature steadily increased starting in the late 70s and early 80s, but has leveled off since around the year 2000. Some other interesting trends reveal themselves in the data. In the State Senate, there has not been a female Republican senator since 2004. Currently Republicans hold only 7 of the 40 State Senate seats. Democrats hold 32 State Senate seats, of which 11 are women (there is 1 vacant seat). In the House, composition of women remains fairly constant across party lines— 30 women out of 125 Democrats, and 8 out of 35 Republicans. Since the legislative session beginning in 1999, there has been surprisingly little change in the number of women in the General Court. Out of 200 total seats in the House and Senate, female representatives have always accounted for roughly 50, or 25%— the lowest it has dipped since 1999 was 49, and the highest it reached was 52. In the most recent election for state legislature in 2016, 72 women competed for 200 total seats in the Massachusetts House and Senate, of which 15 were senate seats and 51 were house seats— there were two female candidates in exactly one senate race and five house races. Twelve of those senate candidates won their elections, as did 40 House candidates. In the state senate, 5 women ran with challengers, and 10 ran unopposed. In the house, there were 25 opposed races and 26 uncontested races for women. The representation of women of color is also important to highlight here: prior to the 2016 election, there were a total of 4 women of color serving in the MA state legislature (2 in the house, and 2 in the Senate). During that election cycle, the two women-of-color senators held their seats, and the house gained 1 women-of-color representative, making the grand total 5. The single biggest factor in a candidate’s electoral success is incumbency— better the devil you know, as the saying goes. Because (predominantly) men will likely never face a serious challenger once they’ve been elected to office once, women are almost never able to knock off an incumbent, and therefore can only compete in races after an incumbent has stepped down. This has led to a sort of equilibrium around 25% representation; women retire and gain new seats at about the same rate. The problem isn’t that women are unwilling to run or that voters are unwilling to elect them— rather, their constraints lie in the power of incumbency and political party machines. Incumbent reelection rates in Massachusetts are prohibitively high for any potential challengers, so much so that the number of contested primaries has fallen steadily over time; currently only around 1/10th of incumbents face a primary challenger. And primaries are the real battleground: nearly every district in Massachusetts is not competitive across party lines, so serious general election challenges are rare. Data circa 2014. As shown, Massachusetts lands right near the middle. The only way that this can change is if more people get involved in state politics. Incumbents win reelection because they are the only ones with sufficient money and backing to launch a successful campaign, and this is discouraging to the point that few are willing to challenge any sitting legislator. Just look at the data: women win 73% of the party primaries they enter, as well as 71% of general elections— the roadblock standing between a gender balance in the legislature lies in the fact that there are so few races for women to enter. And the reason for this is that state politics are unsexy: a state house just does not hold the same weight or allure as the United States Congress, even though most of the decisions that affect our lives most immediately are made on a sub-national level. Q. How in tune are you to national politics? A. Decently in the loop, I read Nytimes (at least the headlines) every morning. I also try to read The Week because it’s more neutral than most news sources. A. Very; I often read/watch/listen to the news, and I try to stay informed on what is occurring in Washington, such as bills or debates on certain issues, as well as elections that are happening across the country. A. I did not pay much attention to national politics, but now that I am 18, I will attempt to focus more so on what changes will be affecting my country. Q. How in tune are you to our state’s politics? A. Definitely less so than nationally, however, I do pay attention to city elections in Cambridge. A. I am usually on top of state politics because I find that they are more directly affecting myself and my family. A. I’m not really following state politics. A. I don’t pay as much attention to politics in Massachusetts as a do D.C., but this is likely because there is much more news about the federal government than MA local government right now. Q. How much research would you do into candidates for state-wide office? A. Not extensive research, but enough to give me a pretty good sense of their policies. A. I would research the candidates thoroughly to see where they stand on certain issues, and vote for the one that I agree with most. A. I do in depth research into candidates for more major positions but not too much for candidates for things like school board. I sent out a Survey Monkey poll to my school about Massachusetts politics, and finally asked them about representation of women. I received 177 responses, but Survey Monkey only allowed me to view 100 responses for free. Significantly more people seemed to know who their state senator is than their state representative, but therein may lie an error— one person I had asked previously in person seemed to misunderstand the question and had thought I was referring to the U.S. Senate when I said “state senator.” Very few were able to name the MA Speaker of the House and President of the Senate, which was not at all surprising. When asked about the representation of women, most agreed that there were too few women in the state legislature. Interestingly, all the respondents who answered “other” gave similar responses (that they simply don’t know what the gender breakdown of the MA legislature is). The data seem to confirm that few know much if anything about Massachusetts politics, and that the gender equality of the legislature is certainly not a pressing issue at the forefront of most people’s minds. Do you know who your representatives are in your state’s legislature? 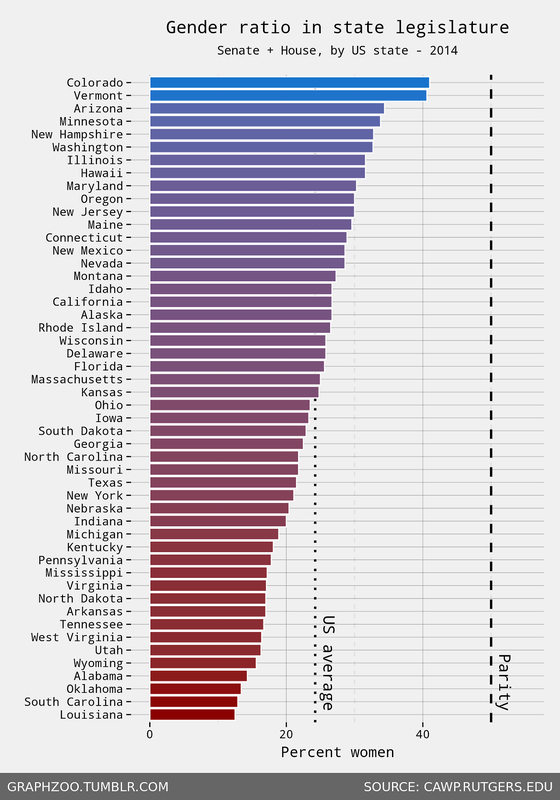 Do you feel that women are accurately represented in your state/country’s legislature? If you live outside the U.S., check out how your country stacks up vis-à-vis gender parity here. If you live inside the U.S., note how out of 192 countries looked at, the United States ranks 102nd. Yikes! Here’s the data, ~visualized~. The greenest country (Rwanda) has a legislature made up of 61.3% women. Second to Rwanda is Bolivia, with 53.1% women. No other countries passed the 50% mark, which, of course, means achieving gender parity. At the other end, Micronesia, Papua New Guinea, Vanuatu, and Yemen tied for last with a grand total of… zero women in their government. Grassroots organizing and a real political will on the part of the voters are essential to achieving gender parity in legislatures in Massachusetts and across the country. Fighting for democracy means fighting for equality, and that fight must take place on all fronts. Find out who represents you: OpenStates.org lets you type in your address and will tell you who your state representatives are, as well as their committee memberships, bills they’ve sponsored/co-sponsored, and voting records. Try to keep up with local news: obviously, every state will have different local news sites, but for my Massachusetts pals: MassLive.com and Boston.com are both great. Get involved: donate to or volunteer for a local campaign! Organizations like EMILY’s List that support female candidates running for office are great for finding ways to get politically active. Koczela, Steve, and Jake Rubinstein. “How The Mass. Legislature Can Get Closer To Gender Balance.” How The Mass. Legislature Can Get Closer To Gender Balance | WBUR News, 6 Dec. 2017, www.wbur.org/news/2017/12/06/beacon-hill-women-representation. University of Massachusetts, Boston: Center for Women in Politics and Public Policy. The 2016 Election: Women in the Massachusetts Legislature. John W. McCormack Graduate School of Policy and Global Studies, Nov. 2016, www.umb.edu/editor_uploads/images/centers_institutes/center_women_politics/WomenMALeg_10November2016.pdf. “State Fact Sheet— Massachusetts.” Center for American Women and Politics, www.cawp.rutgers.edu/state_fact_sheets/ma. Massachusetts Caucus of Women Legislators. “History of Women in the Massachusetts Legislature 1923 – 2015.” State Library of Massachusetts, 1 June 2015, archives.lib.state.ma.us/bitstream/handle/2452/264678/ocn910514718.pdf?sequence=1&isAllowed=y. Great job on this Jeremy! You shined a spotlight on an issue that gets about as much play as the rest of state politics despite being very important.